Ready or not, here it comes: A major winter storm — a powerful nor'easter. --First flakes and drops enter SW NJ starting around 8 p.m. Monday. --Heaviest snow will fall within the window of 2 a.m. to 2 p.m. Tuesday. --Absolute peak intensity of the storm in NJ should be centered around 8 a.m. Tuesday. --Tapering begins Tuesday early afternoon. --Additional snow showers will be possible through Tuesday night, and possibly part of Wednesday. The "sweet spot" of this forecast has always been North Jersey, especially north and west of the NJ Turnpike. That's where the combination of freezing temperatures and abundant lift will produce some impressive snowfall totals, on the order of 1.5 to 2 feet (18 to 24 inches). The Turnpike corridor itself is expected to fall just shy of the biggest totals. But 10 to 18 inches is still an incredible amount of snow. As the storm tracks very close to the Atlantic coastline, temperatures at the surface and aloft (about a mile up in the atmosphere) are forecast to surge above freezing for at least part of the storm. That means the precipitation is like to transition from snow to sleet to rain (and back again). Such mixing will limit snow totals to the 4 to 10 inch range, from the Monmouth and Ocean County coastline to the I-295 corridor. Somewhere in this area will be a very sharp cutoff between who gets "a lot of snow" and who gets "not much snow". The potential is still there for a significant snow storm, but the threat of heavy snow will be considerably less than further north. Along far southern Ocean, coastal Atlantic, and Cape May counties, this storm will probably dump mostly rain. It'll still be a nasty weather day overall. And there will still be some snow. But accumulations will be light or negligible, perhaps up to 4 inches. We will see widespread sustained winds of 20 to 30 mph throughout the day, with occasional gusts over 40 mph inland and over 50 mph along the coast. Scattered power outages are likely. Widespread power outages are possible. The technical definition of a blizzard actually has nothing to do with how much snow falls. It's all about wind-driven snow, restricting visibility, making driving very difficult (if not impossible). 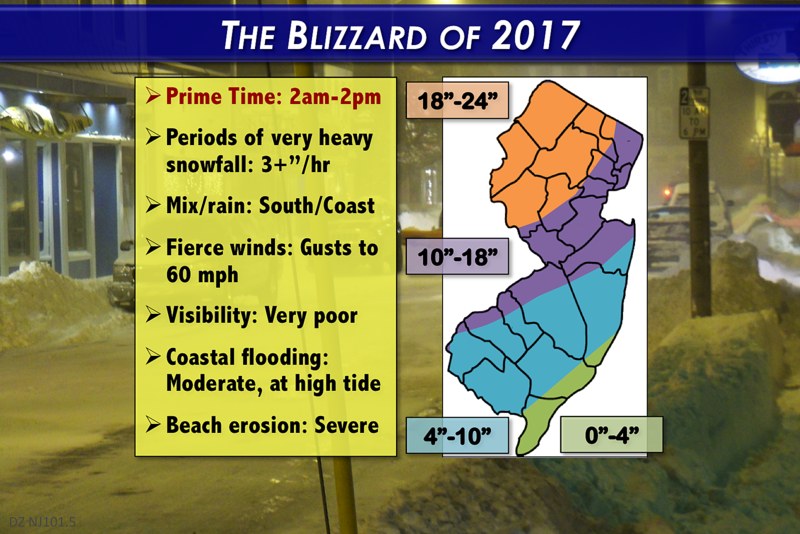 We will likely reach official blizzard criteria for a time — that's why I'm comfortable calling this storm The Blizzard of 2017. Models continue to suggest 2 to 3 feet of surge raising water levels along New Jersey's oceanfront and bays. That will push water levels just above the "Highest Astronomical Tide" level, into the Moderate Flooding category. (Not "major" and not "historic".) It'll be enough to flood the "usual" coastal roadways, that "always" flood during a major storm. Some road closures and lane diversions may be necessary, and property damage will be possible in low-lying areas. But again, this forecast is much lower than other nor'easters from the recent past. That includes the January 2016 blizzard. Ocean models show this powerful storm will drive 10 to 12 foot ocean waves against the Jersey Shore. Beaches will be battered, and sand will be washed out to sea. Such severe erosion is unfortunately typical for this time of wintertime coastal storm. --Blizzard Warning for Hunterdon, Mercer, Middlesex, Monmouth, Morris, Somerset, Sussex, and Warren counties from 8 p.m. Monday to 6 p.m. Tuesday. --Blizzard Warning for Bergen, Essex, Hudson, Passaic, and Union counties from Midnight Tuesday morning to Midnight Wednesday morning. --Winter Storm Warning for inland Atlantic, Burlington, Camden, Cumberland, Gloucester, Ocean, and Salem counties from 8 p.m. Monday to 6 p.m. Tuesday. --Winter Weather Advisory for coastal Atlantic and Cape May counties from 8 p.m. Monday to 6 p.m. Tuesday. --High Wind Warning for Atlantic, southeastern Burlington, and Cape May counties from 6 a.m. to 6 p.m. Tuesday. --Coastal Flood Warning for Atlantic, southeastern Burlington, Cape May, Cumberland, Middlesex, Monmouth, and Ocean counties from 7 a.m. to 3 p.m. Tuesday. --Coastal Flood Advisory for Salem County (along the Delaware Bay) from 11 a.m. to 3 p.m. Tuesday. --Coastal Flood Advisory for eastern Essex, Hudson, and eastern Union counties (along Newark Bay and the Arthur Kill) from 8 a.m. to Noon Tuesday. I am still concerned about the forecast challenges I have discussed extensively over the past few days: storm track wiggle, the extent of rain/mix in southern and coastal NJ, the sharp snowfall gradient that wintry mix will produce, and the omnipresent unpredictability of mesoscale snow bands. These features are admittedly impossible to predict perfectly — all I can do is try to cover for their inevitability in my snow forecast map above. You should be able to start shoveling out by Tuesday afternoon, even though lingering light snow may persist into Tuesday night and even Wednesday. The snow will be here to stay for a while, as cold will continue to grip the Garden State. High temperatures on Wednesday and Thursday will be well below normal, only in the 30s. Sunshine will be limited too, reducing the chance of significant snow melt. We should start to dig out of this bitterly cold air mass by the end of the upcoming weekend. Sunday's forecast high is about 40 degrees — but that's still about 10 below normal for the final day of Winter. When will we see sustained springtime warm take over the Garden State? Honestly, I don't know! Long-range models keep temps below normal through at least the beginning of next week. Our news, traffic, and weather teams will be camped out at the radio station for the duration of the storm, to bring you the latest on-air and online. I say it so often, and I'll say it again... Be smart, and stay safe, New Jersey!